Hypertension, recognized as the most important risk factor for mortality and morbidity worldwide, disposes individuals to heart failure, kidney disease, stroke, and dementia. In the US hypertension is prevalent in all income, race, and gender groups, with rates and severity particularly elevated among African Americans. Yet, despite a century of investigation, the etiology of the disease remains poorly understood. Our systems investigations into the causes and consequences of primary hypertension starts with developing a theoretical/computational understanding of the long-term regulation of arterial pressure and associated computational models for the governing the relevant normal physiological processes. The next step is to identify the models to represent individual subjects presenting different cardiovascular phenotypes, using distinct parameterizations to represent hypothetical mechanisms (including genetic and environmental) underlying disease. The final step is to perform experimental perturbations designed to test these hypotheses. Major progress to date has been in developing a series of modular multiscale models of the cardiovascular system accounting for autonomic baroreflex, large-vessel arterial mechanics, neurohumoral control of vascular tone, and neurohumoral control of renal blood flow, filtration, and reabsorption. The result is a set of models that are uniquely able to simulate blood pressure control over time scales ranging from seconds to days: in essence, the only extant models of long-term arterial pressure dynamics with pulsatility. This pulsatile component is fundamentally important for applications of the VPR program, including: (1.) using data from in vivo experiments to identify model components; (2.) 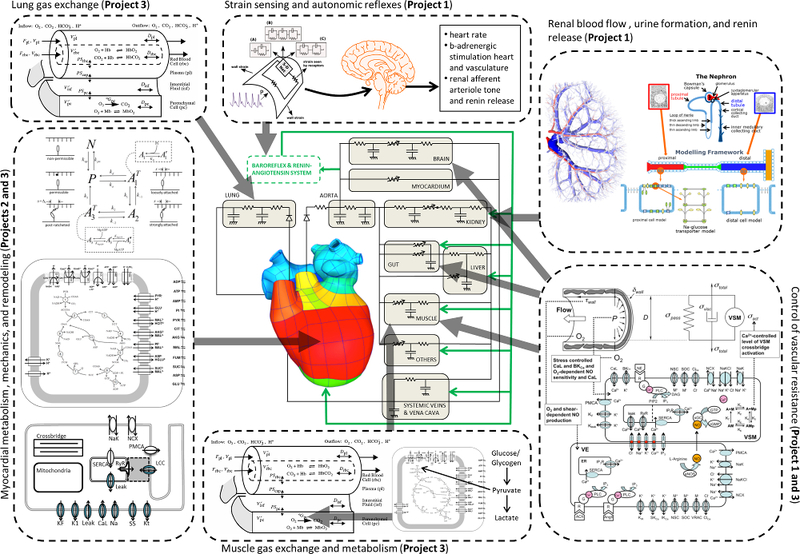 using cardiovascular systems models in concert with whole-organ models of cardiac mechanics; (3.) representing and evaluating novel hypotheses for the mechanisms causing primary hypertension.